The phrase “finishing well” means different things to different people. To some, it means acquiring the most “toys” and wealth. For others, it may mean spending their final years in comfortable retirement. But for the Christian, finishing well means faithfully following Jesus Christ to the very end of our lives and completing the tasks He assigned us so we can one day hear Him declare, “Well done, good and faithful servant” (Matthew 25:21). For the Christian, finishing well means faithfully following Jesus Christ to the very end of our lives. This takes focus, discipline, and commitment—qualities that only grow with a deepening knowledge of Christ and His Word. But there is far too much emphasis in the Christian world today on experience and not enough on knowledge, even in many evangelical churches and schools. The Christian faith is not mere “feeling” but a willful devotion to a rigorous understanding of the person and work of the Lord Jesus Christ. We can only believe right if we first think right, and this requires true knowledge that only begins with “the fear [i.e., respect, reverence] of the LORD” (Proverbs 1:7). The New Testament often uses athletic imagery to portray the importance of finishing well. To the believers in Corinth, the apostle Paul described a disciplined runner in a crowded race who ran with one goal: claiming victory at the finish line (1 Corinthians 9:24-26). To the elders of Ephesus, he emphasized his dedication to ministry by looking forward to finishing his race with joy, even at the cost of his life (Acts 20:24). And in his final letter to young Timothy, Paul could reflect on a lifetime of commitment with a sense of godly contentment, proclaiming, “I have fought the good fight, I have finished the race, I have kept the faith” (2 Timothy 4:7). Perhaps the most concise counsel on finishing well comes from the author of Hebrews: “Let us lay aside every weight, and the sin which so easily ensnares us, and let us run with endurance the race that is set before us, looking unto Jesus, the author and finisher of our faith” (Hebrews 12:1-2). Our very essence is because of Jesus, for it is “in Him we live and move and have our being” (Acts 17:28), and only through Him can we ever really hope to finish well. Because of this, the Institute for Creation Research is preparing very special final exhibits for the ICR Discovery Center for Science and Earth History. Most exhibits will depict major events recorded in Genesis 1–11, and visitors will discover the evidence along the way that affirms the Bible is right and its message is true. But the last displays will focus on the Lord Jesus Christ. Just past the Tower of Babel, the scene changes to depict significant events in the life of Christ. Jesus was not just a good and moral man, as many believe, but the very Creator Himself in human form. He was put to death for us, but glory hallelujah, He didn’t stay dead! The grand finale will feature a stunning 3-D hologram portraying the returning Christ as described in the book of Revelation. This is not the meek Jesus often depicted in medieval art but the conquering “King of kings and Lord of lords” (Revelation 19:11-16) who will return in great glory to establish His kingdom. 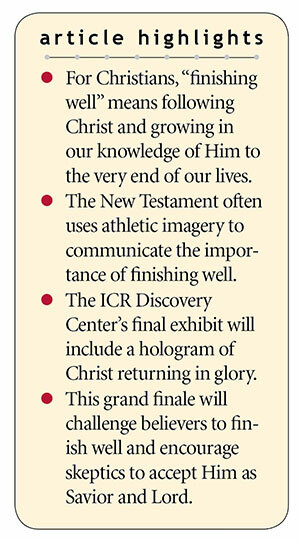 The last exhibit will be a powerful finish to the ICR Discovery Center, and we are praying people will come to accept Jesus as their Savior and Lord. Our very essence is because of Jesus…and only through Him can we ever really hope to finish well. One final note: ICR was recently blessed with a $5 million commitment from a generous ministry partner, and we now need less than $5 million to open this innovative science facility completely debt-free—praise God! Will you prayerfully consider helping ICR “finish well” with a generous gift? The finish line is in sight! Cite this article: Henry M. Morris IV. 2018. Finishing Well. Acts & Facts. 47 (10).